Mencap is a charity that supports people with learning disabilities, they have branches all over the country and run several fundraising initiatives. 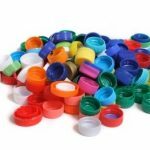 The New Forest branch of Mencap are raising money by collecting plastic bottle tops – from milk cartons and bottles only. Please ensure they are washed and any foil inserts are removed. The milk bottle tops are collected by a recycling company, melted down, and turned into pellets and sold back into UK industry. the recycled plastic is then made into Fence posts, Traffic cones, Plant pots, Gas pipes and Mesh around new trees.